The lower part of the PE Explorer GUI is an activity log window, which records commands and messages and lets you know what is happening during each step. Each time a task is executed from the GUI, a result is written to the log. The log also records warnings and error messages, received from the task. 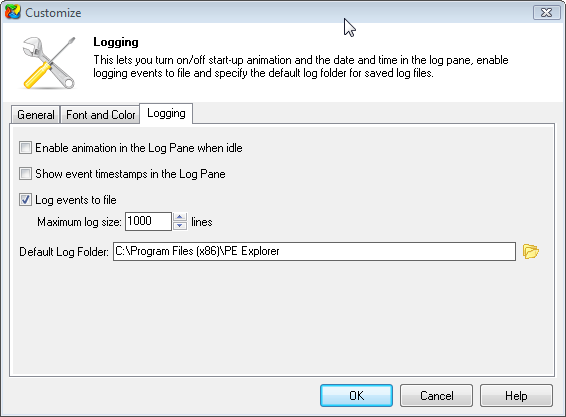 As well as being displayed in the PE Explorer log window, the log is also written to the file "pexlog.log" (enabled by default) in the Application Data directory. So if you want to see what just happened you can open the log file and any recorded actions will be there. How the log is displayed and recorded to disk can be setup using the Customize dialog shown below. To customize the logging options simply use the View > Customize command from the main menu and select the Logging tab.